Rutgers and Princeton played a college soccer football game, the first ever, November 6. The game used modified London Football Association rules. During the next seven years, rugby gained favor with the major eastern schools over soccer, and modern football began to develop from rugby. At the Massasoit convention, the first rules for American football were written. Walter Camp, who would become known as the father of American football, first became involved with the game. 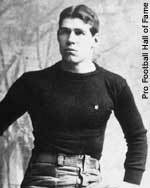 Pudge Heffelfinger was paid $500 to play in a game in 1892, becoming the first person to be paid to play football. In an era in which football was a major attraction of local athletic clubs, an intense competition between two Pittsburgh-area clubs, the Allegheny Athletic Association (AAA) and the Pittsburgh Athletic Club (PAC), led to the making of the first professional football player. Former Yale All-America guard William (Pudge) Heffelfinger was paid $500 by the AAA to play in a game against the PAC, becoming the first person to be paid to play football, November 12. The AAA won the game 4-0 when Heffelfinger picked up a PAC fumble and ran 35 yards for a touchdown. The Pittsburgh Athletic Club signed one of its players, probably halfback Grant Dibert, to the first known pro football contract, which covered all of the PAC's games for the year. John Brallier became the first football player to openly turn pro, accepting $10 and expenses to play for the Latrobe YMCA against the Jeannette Athletic Club. The Allegheny Athletic Association team fielded the first completely professional team for its abbreviated two-game season. The Latrobe Athletic Association football team went entirely professional, becoming the first team to play a full season with only professionals. A touchdown was changed from four points to five. Chris O'Brien formed a neighborhood team, which played under the name the Morgan Athletic Club, on the south side of Chicago. The team later became known as the Normals, then the Racine (for a street in Chicago) Cardinals, the Chicago Cardinals, the St. Louis Cardinals, the Phoenix Cardinals, and, in 1994, the Arizona Cardinals. The team remains the oldest continuing operation in pro football. William C. Temple took over the team payments for the Duquesne Country and Athletic Club, becoming the first known individual club owner. Baseball's Philadelphia Athletics, managed by Connie Mack, and the Philadelphia Phillies formed professional football teams, joining the Pittsburgh Stars in the first attempt at a pro football league, named the National Football League. The Athletics won the first night football game ever played, 39-0 over Kanaweola AC at Elmira, New York, November 21. All three teams claimed the pro championship for the year, but the league president, Dave Berry, named the Stars the champions. Pitcher Rube Waddell was with the Athletics, and pitcher Christy Mathewson a fullback for Pittsburgh. The first World Series of pro football, actually a five-team tournament, was played among a team made up of players from both the Athletics and the Phillies, but simply named New York; the New York Knickerbockers; the Syracuse AC; the Warlow AC; and the Orange (New Jersey) AC at New York's original Madison Square Garden. New York and Syracuse played the first indoor football game before 3,000, December 28. Syracuse, with Glen (Pop) Warner at guard, won 6-0 and went on to win the tournament. The Franklin (Pa.) Athletic Club won the second and last World Series of pro football over the Oreos AC of Asbury Park, New Jersey; the Watertown Red and Blacks; and the Orange AC. Pro football was popularized in Ohio when the Massillon Tigers, a strong amateur team, hired four Pittsburgh pros to play in the season-ending game against Akron. At the same time, pro football declined in the Pittsburgh area, and the emphasis on the pro game moved west from Pennsylvania to Ohio. A field goal was changed from five points to four. Ohio had at least seven pro teams, with Massillon winning the Ohio Independent Championship, that is, the pro title. Talk surfaced about forming a state-wide league to end spiraling salaries brought about by constant bidding for players and to write universal rules for the game. The feeble attempt to start the league failed. Halfback Charles Follis signed a contract with the Shelby (Ohio) AC, making him the first known black pro football player. The Canton AC, later to become known as the Bulldogs, became a professional team. Massillon again won the Ohio League championship. The forward pass was legalized. The first authenticated pass completion in a pro game came on October 27, when George (Peggy) Parratt of Massillon threw a completion to Dan (Bullet) Riley in a victory over a combined Benwood-Moundsville team. Arch-rivals Canton and Massillon, the two best pro teams in America, played twice, with Canton winning the first game but Massillon winning the second and the Ohio League championship. A betting scandal and the financial disaster wrought upon the two clubs by paying huge salaries caused a temporary decline in interest in pro football in the two cities and, somewhat, throughout Ohio. A field goal dropped from four points to three.